On the morning of December 19, Epic finally gave fans the Christmas present they have been asking for, an official Fortnite merchandise store! There are several styles of t-shirts to choose from for $25 that feature Fortnite items like the legendary bush, or a simplistic Durr Burger logo. Unfortunately shipping will not begin until late January 2019, so these gifts will not arrive in time for Christmas next week. One of the exclusive items on the list is an onesie that is similar to the Durr Burger onesie skin available within the Season 7 Battle Pass! The onesie is made out of a soft, white polyester cloth and red cuffs. Even the one-piece suit is covered in official artwork from all of the fictional fast food restaurants in Fortnite! On top of the yellow hood are two plush eyeballs to keep an eye on the enemy, of course. The onesie is available in sizes extra small to 2XL and will cost $70. The Durr Burger onesie will be available in late January 2019 once shipping begins. 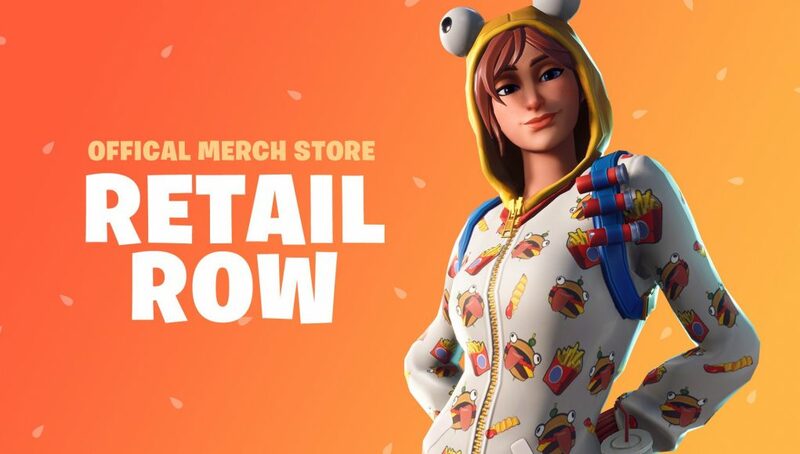 You will only be able to find the Durr Burger onesie exclusively through the Retail Row shop, so jump on it while you can! North American customers can order from the global store that ships out of the United States. Those in Europe will have to use the store that ships out of the United Kingdom.